Farmers have been advised to take steps to control ticks in sheep. 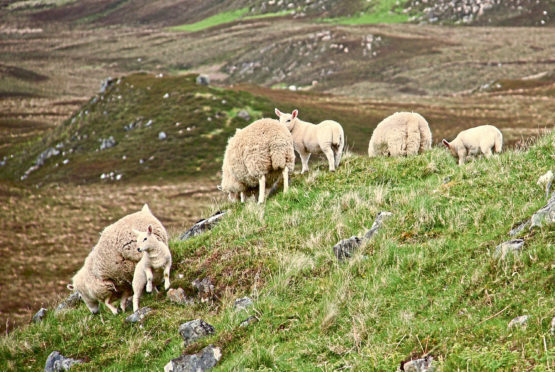 Farmers and crofters have been advised to take steps to protect their sheep from ticks. According to animal health firm Zoetis, a nationwide shortage of a vaccine to protect sheep from the tick-borne Louping Ill virus (LIV) means producers need to look at additional ways to protect their stock. “Ticks prefer warm and humid environments, so current conditions are perfect for them,” said Zoetis vet Dr Dave Armstrong. He said tick control was essential in high-risk areas to reduce tick numbers and prevent diseases such as LIV, tickborne fever, babesiosis (redwater fever) and tick pyaemia. Dr Armstrong recommended the use of acaricides, which can offer protection for up to 12 weeks against ticks. Brechin farmer Graeme Mather, of Shandford Fern, who also manages sheep on the Glenogil Estate, says the use of an acaricide has been vital in controlling ticks. Mr Mather has been involved in various tick control trials since 2002, and in a trial where a proportion of the sheep were left untreated they were each covered in 30-40 ticks compared to no ticks on sheep in the treated group. He said the estate’s 1,300-strong flock is now treated with an acaricide throughout the year and tick numbers have reduced. Mr Mather said: “There are still little pockets on the hill where ticks are a problem, but the situation has improved drastically.